In today's blog post, we'll dig into a Small Basic sample that will select 10 random winners from folks who took the Small Basic 1.2 Feedback Survey! No Starch Press is giving away 20 books as prizes to that contest! And today we're announcing the winners! Those 10 winners received emails to get their printed books! Now that we know our 10 Feedback winners, let's pick the 10 random winners! I'm going to do it as a Small Basic sample! First, I wrote a line that declares a simple array, which is like having one variable that collects an unlimited number of strings. It collects as many different strings or items of data content that I feed into it. contestants = "1=TB;2=KA;3=JN;4=TKG;5=TE;6=JDC;7=DBe;8=RAD;9=CA;10=CB;11=MT;12=JD;13=LM; 14=PH;15=JAu;16=DH;17=TMC;18=JAb;19=GC;20=DMK;21=DL;22=JC;23=DF;24=AHa; 25=GH;26=BR;27=RP;28=WC;29=SP;30=ArR;31=JH;32=AM;33=AmR;34=JI;35=RI;36=DBu; 37=BS;38=JK;39=EN;40=CK;41=AnH;42=OH;43=SG;44=DS;45=KP;46=SM"
That's all one line! It's just a long line. In this case, I assigned 46 strings into an array. Those 46 strings are each just a few letters that represent the 46 contestants. I took the total number of people who took the survey, and then I subtracted any folks who already won the printed books (see 10 Feedback Winners above). What was left was those 46 contestants. I assigned them to the contestants array. I used the TextWindow object, since I'm going to be displaying text in the text window. I used the TextWindow object's WriteLine method to write a line of text in the text window. And the text is "The Winners are:" to let the reader know very easily what this list is all about. I'm ready for my next line! For my third line, I just added a blank line to make it easier to read. It's time to start the For loop! This loop starts at the number 1 and goes 10 times. That's all this line means. So whatever is inside this loop gets 10 passes. We need to make each pass count! We selected a winner! We use the Math object's GetRandomNumber method to, yup you guessed it, select a random number. The 46 means the random number will be between 1 and 46. Pretty easy! Then it's assigned into our new variable, winner. The variable is a container that holds one thing at a time. Now it's holding the number that corresponds to one of our 46 winners! What just happened? Well, a While loop runs the loop only as long as the condition is true. The condition is contestants[winner] = 0. This uses the winner number we just randomly assigned (for example, let's say it picked the number 22 from the choices of 1 to 46). Then it checks into the array we declared (back in line 1), looks at the value of the winner number (in the example, it looks into the #22 spot), and sees if the value for that number is 0. Obviously, none of those strings are the number 0 (and the value of our contestants spot in the array is JC)! So in our first iteration of our For loop, this While loop checks, finds the condition is false (nothing is valued at 0), and it never runs. It just skips ahead. Then why am I using it? Well, later on I'm assigning values to zero after I select them as the winners! Why? Because this way I make sure we don't select the same winner twice! I'll explain this more in a bit. Now line 9 is a blank space. Why? Sometimes your code just needs a break! It just needs some breathing room so that you can visually see where one thought ends before starting another thought. We use WriteLine to display another line of text out in the text window. The N variable displays the first number in the list (since this is the first time we're running the loop, and we'll run it 10 times). So it displays 1. The plus symbol conctatenates (glues) the period with a space, so it looks like this: (1. ). Then the plus sign concatenates the value of our first winner (so if the randomly selected number for winner was 22, then it displays: 1. JC). More about the N variable: The variable N is used by the For loop to count the loop from 1 to 10. Each time the loop runs, the For loop increments the value of N to one number higher. So by using the variable N here, we can display the number for each of the 10 lines. For example, we started at number 1 (the first time the For loop runs), and the first line in the list in the text window, displayed the number 1 (it was 1. JC). The next time the For loop runs, it adds 1 to the value of the variable N, so that it displays the number 2 on the second line of our list! Why didn't we just type out the numbers, like 1 and 2? Well, we're putting all this in a For loop so we don't have to type out 10 different lines of code for these different 10 numbers! We can just use the For loop to add one to the variable N instead. So the third time we run this For loop, the number gets incremented by 1 more, to the value of 3. We have our first winner, displayed on the line! Our 11th line of code is just another space. Now that our winner is set to the value of 0 (instead of to JC), we won't select JC again! On line 5, the variable winner gets assigned a new random number, between 1 and 46. Line 12 sets the second winner to the value of 0, so we don't pick that person again! Then we exit the For loop and go to the third pass! Make sense? If not, leave a comment below! Want the code so you can play with it? And that leads us to the 10 winners selected by the program! There's probably a website out there that randomly selects winners for you, but since this is for Small Basic, and the whole point is to learn computer science, I turned it into a Small Basic sample! A big thanks go out to all 20 winners and everyone who took the survey! We've already put the information to use, and it will be very useful for the future of Small Basic! 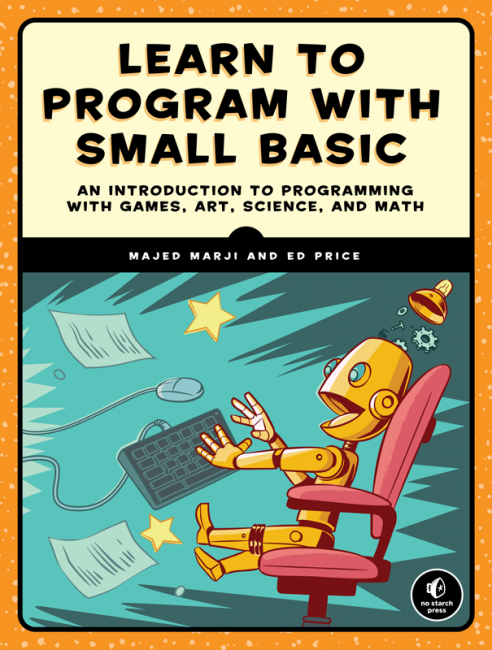 Small Basic is the only computer programming syntax/text-based language and IDE/UI that was built specifically for kids and learners! Keep things Small and Basic! Carl K, can you provide your email? You can send it to SmallBasic at Microsoft dot com. On behalf of Chris Evans, all the winners are sorry for hacking you. Please don’t put us in our prison cells. Just checking to see if I am the John C. that won. I did not receive any e-mail about the e-book so I am guessing it must be a different one. Yes, you are the John C who won. Did you get the email yet? Love this post. Question: why use Number=Number + 1 instead of N being incremented by the For loop? John, good question. I thought it might be simpler to use a separate variable, but it is definitely harder to explain. So I went ahead and just used the N variable instead. I updated the blog post above. Thanks! 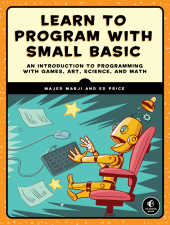 Beautiful, and I congratulate you for your dedication to the community that uses Small Basic every day, to enter the wonderful world of Basic programming. I hope that this programme Small Basic from Microsoft as long as possible remains free and accessible to all. Yled, we have some great improvements coming for Small Basic 1.3! UPDATE: I made a pass, cleaning up the grammar issues. UPDATE: Per John’s comment above, in the sample featured in this blog post, I replaced the “number” variable with the existing “N” variable that was used to increment the For loop. This is simpler, and it helped me remove two lines of code (I just left as blanks).